Red Alert: Save Wild Mustangs named Freedom & Friend before the 4th of July! Freedom (#8527) is a 5-year-old wild mare from the Jackson Mountains in Nevada. She deserves to go to loving a home with another wild mare who will be her buddy for life. Freedom was not born to be domesticated. She was born to be wild. Now she needs to be saved from an uncertain future due to budget cuts and that could mean slaughter! Fill out the BLM’s Sale Application, write the complete freezemark numbers on the top for the wild horses you want to save then email or fax it in: https://blm-prod.opengov.ibmcloud.com/sites/blm.gov/files/wildhorse_howtoadopt_doc4.pdf) and send it to wildhorse@blm.gov or fax to 202-912-7182. Under a December 2004 amendment to the 1971 Wild Free Roaming Horses and Burros Act that should be repealed, wild horses and burros more than 10 years old – as well as younger animals that were passed over for adoption at least three times – are eligible for sale. The younger wild horses falling into this risky category are also known as “3-Strikers”. Purchasing a wild horse or burro for $25 means that ownership of the animal passes immediately from the Federal Government to the buyer. If you adopt Freedom you can return her if you don’t want her anymore. If you buy her you own her quickly and are done with BLM. Please consider buying Freedom with Friend (seen below). Thank you! Freedom is currently located in Palomino Valley, NV. For more information, please contact Jeb Beck at (775) 475-2222 or e-mail: j1beck@blm.gov . Friend needs get out of the BLM’s clutches because her life is at risk now with talk of killing and slaughtering alleged “unadoptable” wild horses! We noticed a bump on Friend’s left cheek so her buyer needs to know about and be willing to help her if she needs it. Pro-Slaughter lobbyists have weaseled their way into the offices of BLM, Department of Interior and America’s elected officials flashing their cash. Freedom and Friend are at risk and the clock is ticking. . . Please help save them! RE: Official request to stop using federally protected American wild horses in cruel experiments, offer all the wild horses at the closed door Indian Lakes holding facility for adoption and provide transparency with public access, etc. Pregnant mares were moved Friday January 22, 2016 from Palomino Valley Center (PVC) outside of Reno to the closed door, privately owned and operated, facility called Indian Lakes aka Broken Arrow, located at 5676 Indian Lakes Road, Fallon, Nevada. Does the Bureau of Land Management (BLM) intend on using the pregnant mares from Beatys Butte, Oregon and other herds in the horrible Nazi-type sterilization experiments in Oregon, Kentucky or elsewhere? The Beaty’s Butte pregnant mares and members of their herd seem to have been rounded up because Country Natural Beef, a supplier of Whole Foods Market, was pushing for the roundup. Do they want the federally protected wild horses gone so they can use the public grazing land for more grass fed beef? 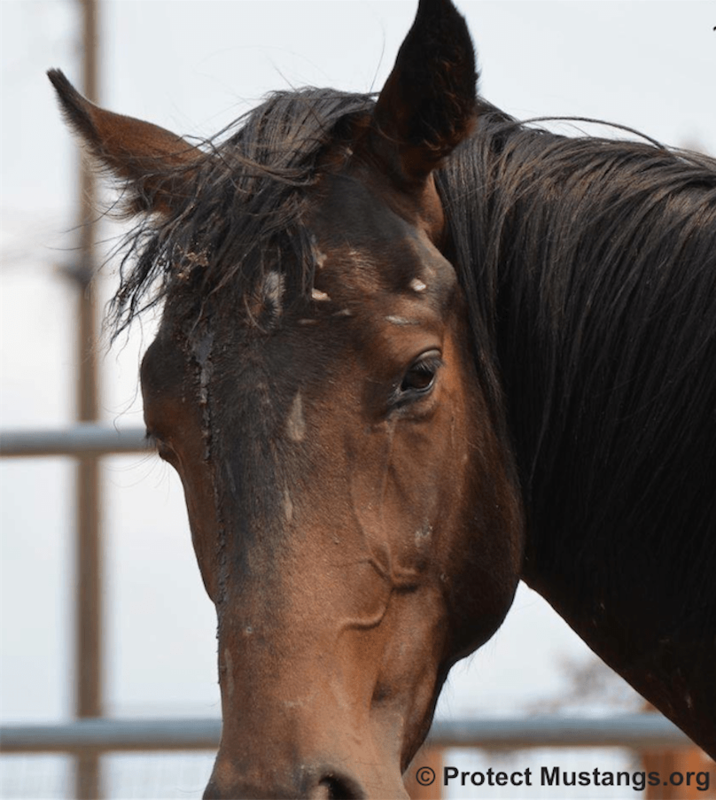 Protect Mustangs officially requests the mares from Beatys Butte, Oregon, as well as all the other wild horses (male and female) at the Indian Lakes facility, be immediately put up for adoption–not experimented on. Wild horses over 10 years old must be offered to the public as well. They are not yours to engage in animal testing. This cruelty must stop now. Halt transporting American wild horses out of the closed door Fallon facility called Indian Lakes (aka Broken Arrow). The public wants to save all these wild horses–including the pregnant mares–through adoption or purchase. Provide all identification numbers and descriptions all the wild horses as well as a headcount of unbranded, untagged wild horses and foals at Indian Lakes as of today January 29, 2016. Provide a separate list of all identification numbers and descriptions of all the wild horses as well as a headcount of unbranded wild horses and foals at Indian Lakes from January 20 to today. Provide a list of identification numbers of all the wild horses who have transported out of Indian Lakes since January 1, 2016 and show exactly where they have gone and where they are now. Grant immediate visitation to members of Protect Mustangs, elected officials and their staff, as well as other members of the public to the closed door facility known as Indian Lakes (aka Broken Arrow) to witness, document, photograph and video all the wild horses for as many days as needed at the facility to help them get adopted in order to keep them safe from cruel experiments, dubious sales or worse. How many wild horses have been sold or given away to be used in research projects, “studies” or experimentation since 2009? How many wild horses have been used in research projects, “studies” or experimentation since 2009 and then later offered for adoption, moved to long-term holding or sold? The BLM’s overpopulation claims are fraudulent and any action such as experimentation for population control, fertility control, or other actions taken that are based on fraudulent information is wrongful. There exists no accurate head counts of America’s wild horse populations and many herd management areas have no wild horses left on them. The BLM’s horrible customer service, lack of problem solving and poor marketing are the reasons wild horse adoption has dropped. The public wants to adopt wild horses but the BLM is making it impossible for adopters to get the wild horses they want. It’s as if the BLM wants their adoption program to fail. Americans do not want their tax dollars funding cruel experiments reminiscent of the notorious Nazi–Dr. Joseph Mengele. The rights of American wild horses are being violated. This is animal cruelty at its worse. All wild horses–especially pregnant mares–must never be used in sterilization or other experiments. There is no overpopulation of wild horses. They are underpopulated on the vast acreage of public land in the West. Even the National Academy of Sciences said in 2013 that there is “no evidence of overpopulation”. BLM’s harvesting model based management via roundups is disrupting herd structure and increasing the birthrate. BLM’s allegations of overpopulation are fraudulent based on false data. Besides no head counts, they don’t even account for the correct mortality rates in the wild for example. Predators should not be killed off and if there are none left then they need to be reintroduced for the thriving natural ecological balance for the herd management area. GonaCon™, PZP, SpayVac® are all pesticides that classify wild horses erroneously as pests–ultimately sterilize them and are not needed because wild horses are underpopulated. There are no “excess” wild horses in America. Experimenting on wild horses to sterilize them is animal cruelty funded by tax dollars and must stop now. The public is outraged the BLM, the federal agency put in charge of managing and protecting wild horses and burros, would engage in animal cruelty and try to use America’s icons of freedom in population control experiments. Any and all experimentation, “research” or harassment of a federally protected wild horse or burro–based on the overpopulation myth, decreased adoptions or any other excuse must stop now. On September 9, 2016, the Bureau of Land Management’s Wild Horse & Burro Advisory Board voted to kill the alleged 45,000 wild horses in taxpayer funded holding facilities and pastures. Do they want to cover-up the fraud that has been going on for years by killing the evidence?